STOP | Southside Together Organizing for Power: Trauma center arrestees claim victory! Charges Dropped! 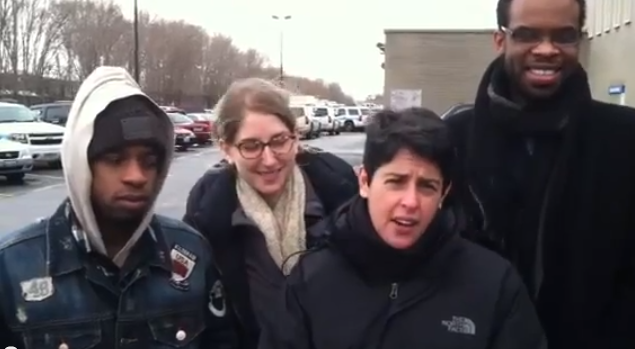 Trauma center arrestees claim victory! Charges Dropped! Fearless Leading by the Youth, a youth-led organization on the south side of Chicago, has been fighting for a trauma center on the south side for three years since the death of FLY founder Damian Turner who was shot four blocks from the University of Chicago Hospital but taken ten miles away to die at another hospital. The south side has no trauma centers for anyone over 15 and the University, despite being the richest hospital in Chicago and receiving tens of millions in public subsidies, refuses to extend its age limit of its children's trauma center or open an adult trauma center. In this video, you will hear Joey Mogul from the People's Law Office, U of C PhD student and Fearless Leading by the Youth (FLY) supporter Toussaint Losier and FLY organizer Darrius Lightfoot explain the results of the court case brought against those arrested on 1/27/2013 during a peaceful sit-in at the University of Chicago's $700 million new research hospital building demanding life-saving trauma are for the south side of Chicago. Rather than meet with youth leaders, the U of C dispatched its police who violently confronted protesters, pushing and knocking them to the ground and arresting four. Due to a groundswell of community and campus pressure, the U of C and State's Attorney were forced to back away from initially serious charges, allowing FLY and its supporters to continue its focus on the ongoing struggle for trauma care for Chicago's south side, an essential demand in the fight for the human right to health care, for racial and economic justice and for an end on the inequalities that are the root of the violence in Chicago.